The global market today is challenging every established or budding business nowadays for greater efforts to achieve success. Ever increasing competition and its fierceness is signaling global businesses to stay alert, react quicker as per the customer needs and perform better, overpowering the competitors. One such aspect that is gaining high-attention is Customer Relationship Management (CRM), it is supposed to be the central part of the business strategies widely covering worldwide customers and their interests. The today’s internet-defined world is revolutionizing the buyers’ behavior and empowering them to select the best from the best-of-the-breed solutions and services. It is generating a need for the corporate entities to produce customer-centric approaches in building corporate strategies. With the rapid fueling advancement of electronic selling channels due to the emergence of WWW and mobile devices, it is necessary to have electronically-managed relationships to outpace the competition. Our perfectly crafted and customized CRM solutions assist clients to drive business value from technology investments as well as capitalize on increased sales opportunities. Our solutions are aimed to focus cost efficiencies, enhance revenue generation system with enhanced communication. 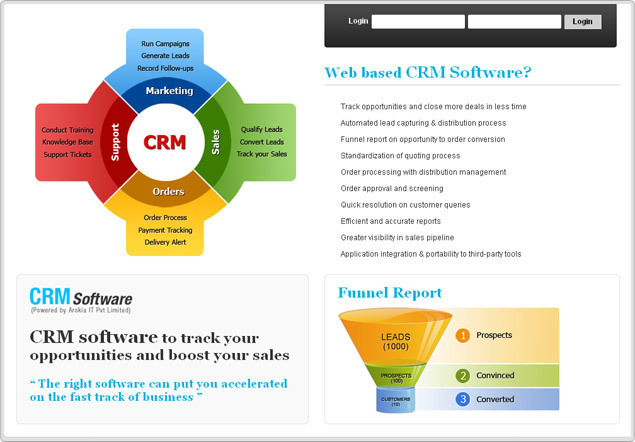 Our experts and consultants will assist you know and understand all the deployment possibilities and help you select the right components of the potential CRM system that are vital for your business processes. The core competencies of Arokia IT Pvt Ltd are designed to offer you both speed and customization power. Our management and development efforts are thoroughly tested hi-grade technology components with enriched functionalities that act as building blocks that address specific business problems. Figuratively, our business application solution can be flawlessly integrated with your current application system. As a result, they primarily slash out the customer response time and qualitatively build the refined brand image of the business.